Looking for a little extra holiday cheer? 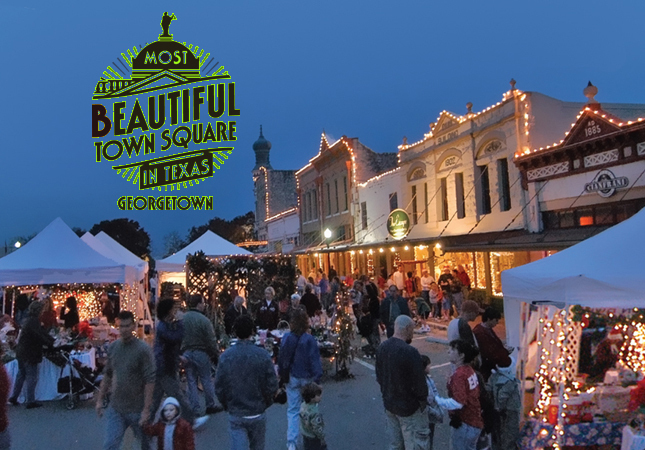 Why not start this holiday season with some ‘Holly Jolly’, family-friendly fun at the 38th Annual Georgetown, TX Christmas Stroll at the historic Georgetown Square? This joyous two-day event is filled with activities for the entire family including shopping, live entertainment, delicious food, a parade and more! There’s so much to do you’ll want to come both Friday, November 30th and Saturday, December 1st. Here’s everything that’s happening so you can plan your visit(s) to the annual Georgetown, TX Christmas Stroll 2018. The Christmas Stroll kicks off Friday, November 30th at 5 p.m. with a kid-friendly event, “Dessert with the Grinch,” followed by a viewing of “How the Grinch Stole Christmas” at 6 p.m. Bring blankets and chairs to sit on while you watch the movie. Still looking for those perfect holiday gift ideas? The Christmas Stroll is also the ideal time to explore the unique local shops around the Georgetown Square and the 150+ artisan, craft, clothing, jewelry, and cottage food vendors that line the streets for this special event. When you’ve had your fill of shopping, enjoy a peaceful walk through the Bethlehem Village or check out one of the two stages featuring live entertainment. Don’t forget to give your taste buds a treat, too, by dining at one of the premier local restaurants or visiting the Bistro Food Court. Friday’s festivities end at 9 p.m., early enough to get a good night’s sleep and come back for more on Saturday! The fun is not over, so be sure to set your alarm and get up early to grab a spot to watch the annual Georgetown, TX Christmas Stroll parade that starts at 10 a.m. on Saturday, December 1st. Don’t forget to bring an unwrapped toy to hand to the elves taking up collections for Blue Santa along the parade route. Following the parade, make sure you plan enough time to spend the day exploring all the fun events and activities scheduled until 8 p.m. The young at heart will love visiting and snapping a picture with Santa, getting a hilarious hairdo at the “Who Hair Parlor”, crafting at the Home Depot “Make and Take” booth, taking a train ride, climbing the Mt. Everest Climb-n-Slide, or playing street hockey. Also, the stores on the Georgetown Square and the 150+ vendors lining the streets will be open again on Saturday from 10 a.m. to 8 p.m. so you can pick up any items you missed from shopping the night before. And, of course, there’ll be even more live entertainment from local performers, area schools, and organizations happening throughout the day. The Annual Christmas Stroll is one of Georgetown’s most beloved events, and it’s the perfect way to get your whole family in the spirit of the holiday season! It’s okay to be a little selfish! Why not use your trip to the Georgetown Christmas Stroll as an excuse to stop by Gardens at Verde Vista and change your life in 2019? Every detail of our luxury, low maintenance community is tailored to help you simplify life and discover the blissful freedom of true lock and leave convenience. Full landscape services are provided by the HOA, and every perfectly sized garden home and villa is spacious enough to allow you to live comfortably without the hassle of cleaning a bunch of extra rooms and space you never use. Schedule a private tour of Gardens at Verde Vista’s model and move-in ready homes, brand new private Amenity Center, and Final Phase of beautiful Hill Country home sites, and learn more about our exciting end-of-year incentives! Don’t wait, contact us today to start your journey towards a new “Life Without Limits”… where every day feels like a holiday!